What was the Red Phone? 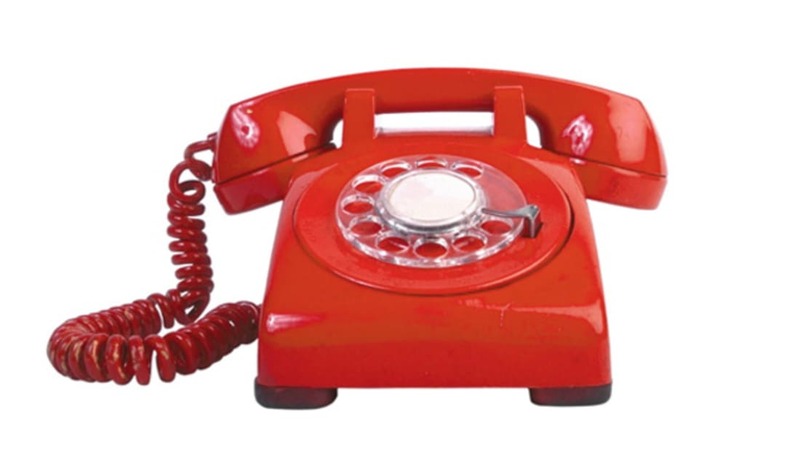 The Red Phone, also known as the Red Telephone, the Moscow-Washington hotline and the Hot Line, is a "confidence building measure" and communications system designed to decrease tensions and prevent accidental nuclear war by providing direct contact between the leaders of the United States and Russia. It links the White House (via the National Military Command Center) with the Kremlin. A year later, the Cuban Missile Crisis, a confrontation over the presence of Soviet missiles in Cuba brought the world to the brink of nuclear war. While that's scary in and of itself, the way the two nuclear superpowers communicated with each other during the crisis is downright terrifying. It took the US almost 12 hours to receive and decode a 3,000 word telegram from the Soviets, and by the time the Americans drafted a response, the Soviets had already sent another message. Meanwhile, the Soviet ambassador to Washington had have a bicycle courier pick up his messages take them to a Western Union office in order to communicate with Moscow. Hindsight being 20-20, after the crisis was resolved, both the US and USSR realized the situation could have been resolved faster with a modern, efficient communication system. On June 20, 1963, spokesmen from both countries signed the "Memorandum of Understanding Regarding the Establishment of a Direct Communications Line" in Geneva. Contrary to its portrayal in pop culture, the system is more than a pair of red telephones. In fact, the system didn't involve an actual telephone until the 1970s. The memorandum that established the system stipulated "one full-time duplex wire telegraph circuit," since it was thought that that text would reduce the chance of poor translation, give each side time to consider the other's message before replying and prevent a person's tone of voice from being misinterpreted. The telegraph circuit was routed Washington-London-Copenhagen-Stockholm-Helsinki-Moscow, and a second link, routed Washington-Tangier-Moscow, was used a back up. Identical teletype terminals were set up in Washington and Moscow, staffed by teams of communications experts and interpreters. The Moscow terminal, dubbed the Red Phone by the Soviets, was placed in a cell under the Kremlin, and the Washington terminal was placed in the Pentagon at the National Military Command Center. The memorandum also stipulated that each country provide the other with the necessary equipment for the terminals free of charge. In 1971, the system was upgraded. A phone line was installed and the secondary telegraph line was eliminated. The main telegraph line was then complemented by two satellite communication lines, formed by two US Intelsat satellites and two Soviet Molniya II satellites. The system was upgraded again in 1986. The Soviets replaced their satellites with modern stationary Gorizont-class satellites, and high-speed facsimile transmission capacity was added. This allowed the quick exchange of large amounts of information, including images and documents, along with voice and teletype messages. When the hot line is used on the American end, a message from the president is sent from the White House to the command center via coded phone, electronic transmission or messenger. The officer in charge of the center contacts the White House to verify the message. Once the message is verified, it is encoded and sent to Moscow (in the early years, the teleprinters were only able to send material at the staggering rate of 66 words per minute). Messages from Washington are transmitted in English and messages from Moscow transmitted in Russian, using Cyrillic characters, with translation being handled on the receiving end. Has it ever been used? There have been several instances where the hotline has been used that the public is aware of, and probably many more that we don't know about yet. Moscow used the system for the very first time on June 5, 1967, during the Six Day War. President Lyndon Johnson said in his memoirs that he remembered answering the phone in his bedroom and hearing defense secretary Robert McNamara say, "Mr. President, the hot line is up. " Just a few hours earlier, war had broken out between Israel and its Arab neighbors, and the Soviets wanted to know if the United States had taken part in Israel's surprise attack on Egypt. Over the next several days, the two sides used the hot line to send as many as 20 messages, mostly to inform each other of the intentions and maneuvers of their navy fleets, which were in close proximity in the Mediterranean. Richard Nixon also used the hot line when tensions were sparked between India and Pakistan in 1971, and again two years later during another Middle East conflict. Jimmy Carter and Ronald Reagan both used the hot line to flex their muscles; Carter contacted Moscow to protest the Soviet invasion of Afghanistan in 1979, and Reagan is said to have threatened the Soviets over their arrest of a US journalist on espionage charges. Most recently, the system has been used during the post-war occupation of Iraq to allow for discussion of peace-keeping and rebuilding efforts. While its official uses might be few and far in-between, the hot line functions 24/7 and is tested hourly, with the Pentagon sending a message every even hour, and Moscow sending a response every odd hour. Since something must be said in the messages, operators on both sides have made a game of testing each other's translation skills. The U.S. operators are fond of sending recipes for chili and magazine articles, while the Russians respond with excerpts from Dostoyevsky novels.